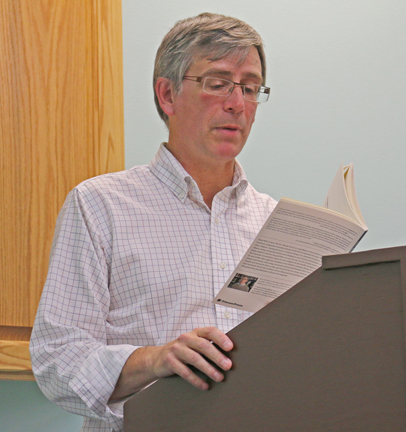 Author Brett Loney reads an excerpt from Rebel With a Cause: The Doc Nikaido Story at the book launch. Dr. Harry Nikaido was a person who Brett Loney always thought was interesting person as he was growing up in Bow Island. The unique local physician lived a frugal life while practicing medicine in Bow Island, only charging what he would need to survive and not a penny more, but it was as Loney was doing this research that he learned why Nikaido lived the life he did. “You couldn’t find a more interesting person to write about. I knew Doc as a person and over the years, I though about him more and more,” said Loney, who has also written several fiction books and initially, was going to write a story where Doc was a character. It was three years ago when Loney was home for the Bow Island Centennial that he decided to write a book about Nikaido himself. “I was driven by a passion for my hometown. What I learned was I could not make this stuff up. I couldn’t do it as a novel. As I started interviewing people at the Centennial, I realized just how important he was to Bow Island and I felt I had the responsibility to write this book,” said Loney of Rebel with a Cause: The Doc Nikaido Story. Loney said during the process, he learned more about the terrible injustice placed on the Japanese-Canadians during the resettlement process in WWII. 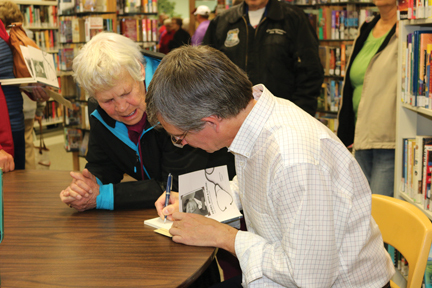 Loney interviewed more than 40 people in five provinces when doing his research for the book. “I got to learn a lot about Doc and I also got to know a lot of people who I hadn’t seen in many years,” he said. Fred Mellen and Robin Dann provided the opening remarks at the book launch, held at the Susan Andersen Library in Bow Island last week and both gave anecdotes about how they knew Doc Nikaido. Dann said Nikaido could have practiced Medicine anywhere he chose, but chose to make Bow Island his home and live a simple life. Over 100 people came out for the last week’s book launch and get signed copies of Rebel With a Cause: The Doc Nikaido Story. 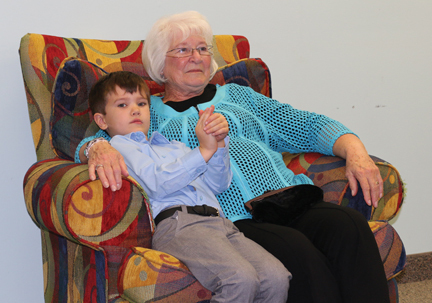 Jonis Loney sits with his grandma, Jeanette Loney as his dad reads from the book. Audrey Bereskowski gets her copy of the book autographed by Brett Loney.